Quite frankly, I find this tuna salad addictive. To avoid developing new food allergies, I generally rotate what I eat so that I don’t eat the same thing in more than one 24-hour period every four days or so. But once I’ve made this tuna salad, I’m all in until it’s gone. I had this tuna salad on my meal plan for later this week, but once I bought the ingredients on Monday, I couldn’t resist making it and eating it for lunch that day. Then we had it for dinner . . . and for lunch the next day. I had the last bit for lunch today, as well. And, well, I kept glancing at the clock after 10 a.m. to see whether it was time for lunch yet so I could go eat it. I came to fish during early adulthood. We didn’t eat fish at home when I was growing up. At other people’s houses and parties, we’d sometimes have fried catfish (this is the South). At seafood restaurants, I’d eat fried seafood. But seafood that wasn’t fried smelled and tasted far too much like . . . well, like the ocean. I’m glad to say I’ve been getting over that issue. In the same way that I now like that beets taste like the earth they grew in, I understand the pleasure of eating foods that are reminscent of the ocean’s complex tang. Of course, you have to be careful about which fish you eat, as we as a planet are at risk of collapsing various fish populations. I carry a Monterey Bay Seafood Watch Pocket Guide in my wallet to check my choices when I’m shopping. With the right source for tuna, it’s okay in moderation. Or, I hope, in intense batches of consumption followed by temporary abstinence. . . . This salad changes a bit each time I make it. Trust yourself to taste the salad as you go and figure out what you need to add, and it will come out great. Toast the walnuts using your method of choice. When they are toasted and cooled, chop the walnut halves into quarter-size or smaller pieces, and place them in a medium-sized bowl. Meanwhile, combine the meat of the avocado(s) through the agave in a blender, and blend well. If your avocado is too firm or is pretty big, you may need more hemp milk to make it blend well. Add the sauce to the walnut bowl. Chop the fresh herbs. Chop the green onions (both green and white parts). Add the herbs to the walnut bowl. Open the cans of tuna, drain them, and run a sharp knife in cross sections in the can to cut the tuna into bite-sized (or smaller) pieces. Shoo your meowing cats from the kitchen. Stir the tuna into the sauce mixture. Taste the mixture, and add additional herbs, mustard, lemon, salt, etc., as needed. Serve immediately, or cover tightly and store in the fridge a day or two. Serves 4-6, depending on measurements used. 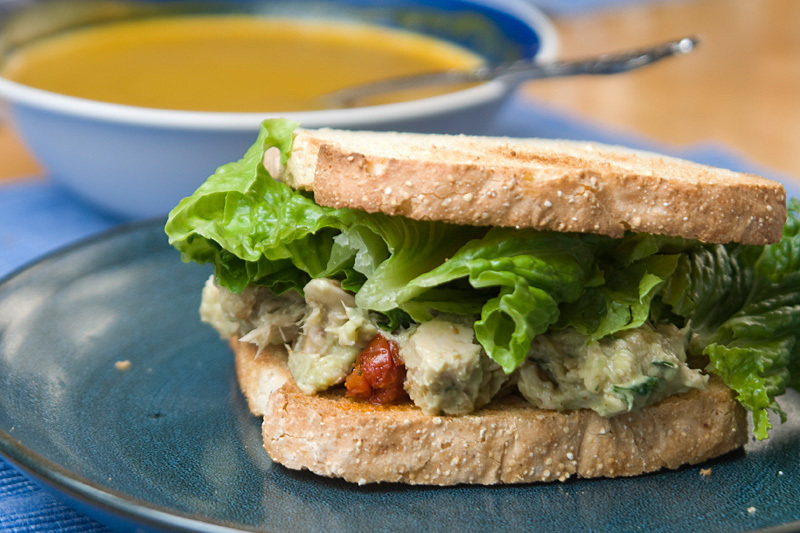 We like to eat the tuna salad on toasted bread—with fresh tomato slices and lettuce in the warm seasons, and sundried tomato pieces and lettuce in the cooler seasons. (The addition of the sweetness of the sundried tomatoes may be part of my addiction.) I’ve also eaten this on crackers, on cucumber slices, and tucked in Romaine leaf wraps. It’s yummy all these ways! Giving the drained water/oil from the tuna to the cats instead of throwing it out makes everyone happy! OH MY GOD. I am going to be eating this for like, every meal. Tuna salad? Made out of avocados? Tell me you have done this with chicken. Sounds divine. Thanks for the idea. THis actually reminds me how much I love MOCK tuna salad (made with chickpeas instead of tuna). I bet this would be great for that! The avocado and walnuts are brilliant. [WORDPRESS HASHCASH] The comment’s actual post text did not contain your blog url (http://aprovechar.danandsally.com/?p=425) and so is spam. I see that you are allergic to soy, but do you think tofu would work as a substitute for the tuna? I love tuna “freed” (no egg, etc) salad! The soy free and avocado-loaded salad here has my mouth watering (its 9 am, weird time for tuna…). Your inclusion of hemp is a great idea- I’m a hemp lover. It is only appropriate that I oogle your tuna salad here as I tell you that you won yet another Excellent blog award from Cindalou’s! I love your blog and find your posts very inspiring (and appetizing). Thank you so much for sharing your life with the rest of us. I also use the seafood guide. Their website does have a handy pdf purse-sized printout of the lists which I always carry around with me (w/ coupons, of course!). Hope all is well with you. Absolutely scrumptious! I cannot tell you how overjoyed I was to find this recipe. While I don’t have restrictions on my diet, I try to eat healthy and I despise most mayo based foods, the stuff just makes my stomach turn. This was such a great alternative to a traditional tuna salad. It is now going to become a staple here. Thank you! I love your recipes. My nephew loves chicken salad and sandwiches. The problem is that he is allergic to all egg products, all soy products, shortening, mayonnaise, and nuts.I wish yhere was a mayonnaise homemade version free from eggs and soy. Thanks for the compliment, Mary. Thank you Sally for the mayo recipes. I’m not a crazy tuna eater, but I sure do love chicken salad! I want to try this as soon as possible… my husband loves to take sandwiches to work. Yum. I’m not an expert by any means, so the nest question may seem somewhat foolish. How healthy is this tuna recipe for someone who want to lose weight and (unhealthy) fat intake? Hi, Tom. Opinions on fat vary, but I think most dietitians agree that the kind of fat in avocados is a healthy kind of fat. Avocados are also rich in vitamins. However, an avocado has around 300 calories and 25 grams of fat in it, so for weight loss, I might stick with using one avocado in the recipe and having a salad that’s a bit less creamy than it is with two. More importantly, I would serve the tuna salad over an otherwise low-calorie, delicious mixed green salad (or Romaine) with sliced cucumbers, shredded carrots, and possibly sliced Roma tomatoes. THANK YOU for this recipe, it was great! It’s really nice if you throw a few raisins in that were soaked in a little apple juice overnight. Try it. I loved this also. I made a very toned down version minus lots of stuff but the avocado and tuna mix was fantastic and my husband loves it too! This is fantastic. We ate it with some chick pea flatbread and it was wonderful. Thanks for the idea. Gave this a try today. My husband and I are trying to reduce the saturated fat and cholesterol in our diet, while increasing our intake of fish. (Not easy when you dislike fish!) Anyway, we both thought that this was a very tasty alternative to traditional tuna salad! Thanks so much for the recipe. Amazing, best tuna salad ever! I just made this tonight and halved the recipe, which yielded about 3 servings. Instead of the herb combo, I threw in 2 tbsp. of fresh dill. I didn’t have mustard on hand, so I added a splash of Trader Joe’s orange muscat champagne vinegar. Thanks very much for the outstanding recipe. Delicious recipe, thank you! I actually used it to make a chicken salad. Sautéed several boneless breasts of chicken in a pan with a bit of olive oil, let them cool, then shredded. The rest remained the same (I used a bit of coconut milk), and put the chicken in instead of the tuna. Yumm!! Very good! I had the mix in a wrap with a schmear of southwestern hot ranch dressing! With or without my dressing this mix is fabulous!